Just standing my apartment with this apron on. Looking off into the wide world of cooking and keeping clean shirts possibilities. Behind me there is a brand new Janome QDC 3160, but we'll talk about that later. This is about how silly easy it is to make an apron (and save shirts!) from cute and on sale Anthropologie dish towels. 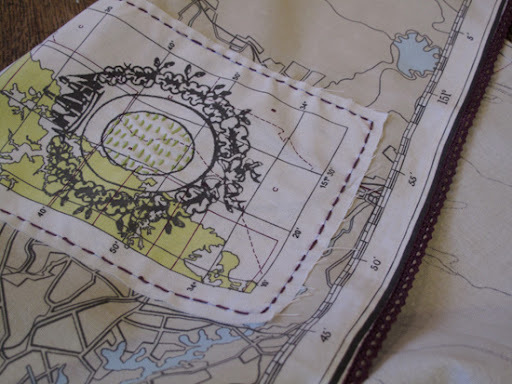 Get a lovely sale dish towel from from Anthropologie (this one is a map and, I can only asume, made for me). This is especially easy if you live as dangerously close to Anthropolgie as I do. 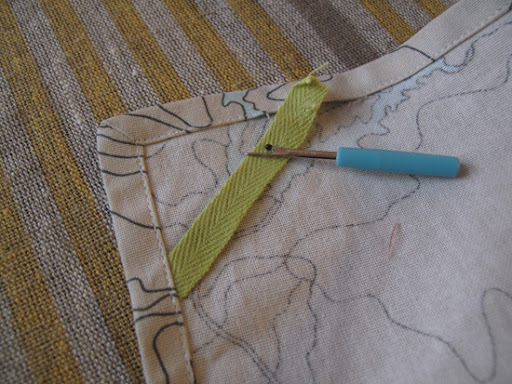 Use your seam ripper to take out the hook-loop. You'll probably end up cutting this piece out anyways, but might as well. 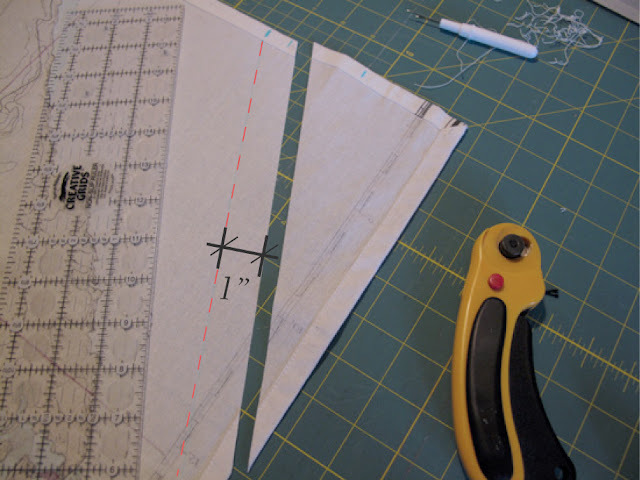 Cut a 20" piece of your twill tape and then divide the remaining bit in two. You'll want about 9.5 inches left on the top for your neck and the waist ties to be about 11inches from the top. But, remember, you're making this yourself so it can be your exact fit: pin the pieces of tape to towel and try it on to be sure. When you've decided on the spots, mark the backside of your napkin as shown in the illustration and connect with a line. And... use a chalk or disappearing marker to do so! Cut your towel 1" above the outside of your line (not inside toward the center of the towel). Using a seam ripper, rip the seam of your towel out from the inside of your top mark wide enough to fit your twill tape. Do this on both sides. Next, insert your twill tape, stitch it down, recreating the stitch you ripped. 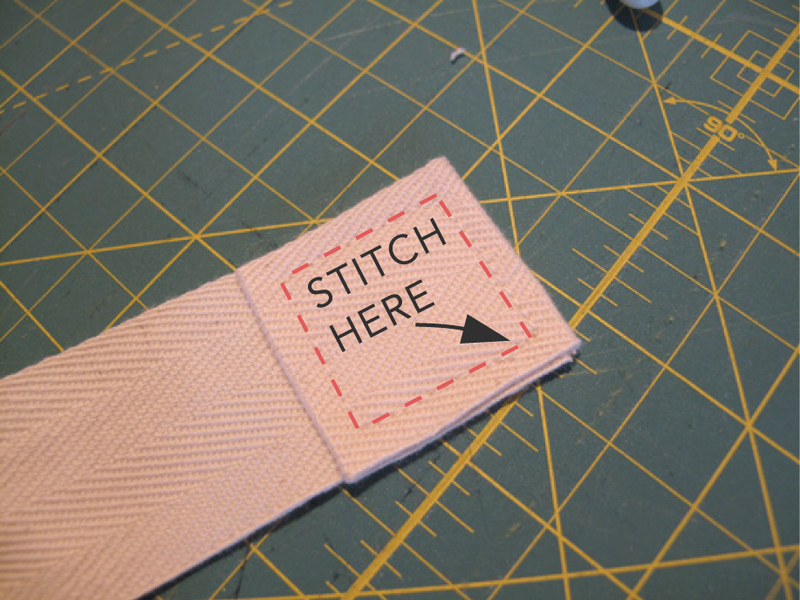 Fold the tape up and stitch again at the top of the seam. Repeat on the opposite side, but be sure that you fold your tape in the correct way so that it lies flat on your neck and isn't twisted! Next, create new hems. 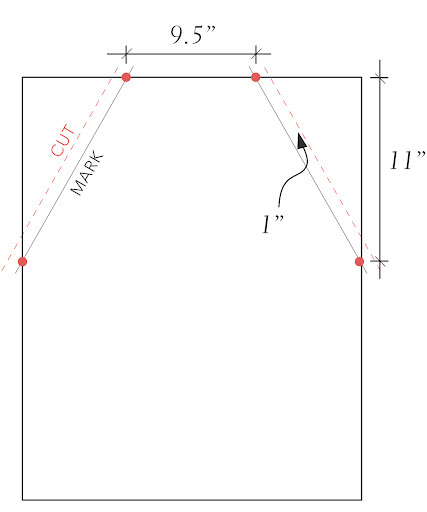 Fold your hem in from the raw edge you cut to the line that you drew, this should be half an inch. Press in place. Fold the outside edge in again, pin and press. Top stitch this new edge in whatever way the rest of the towel is edge, most likely, like mine, you'll stitch nearest the inside edge of the hem. Do this on both sides. 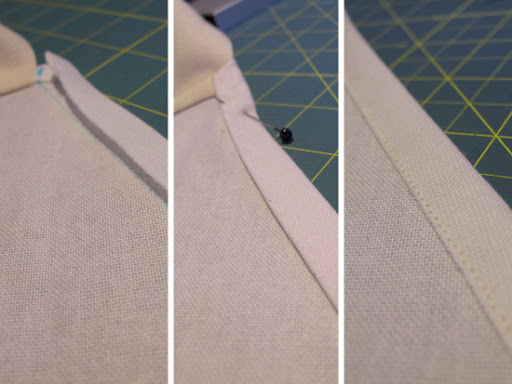 Take your two remaining strips of twill tape and fold one side in about an inch and a quarter or so, then fold again. Press and stitch in a square to secure. Do this for one end of each piece. In the same fashion as you did to create the neck, remove the stitches in side seam starting at the intersection of your new angled edge and the original side of the towel. 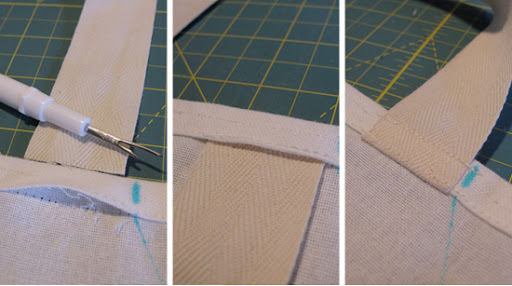 Sew on each piece of tape in the same way; tuck into the seam, stitch, fold over and stitch at the top of the seam. I never quite know how to end the series of steps in a fun way - maybe I should have inserted [drumroll, you're almost there!] somewhere in the last step. But nevertheless, if you haven't noticed, well, you're done! 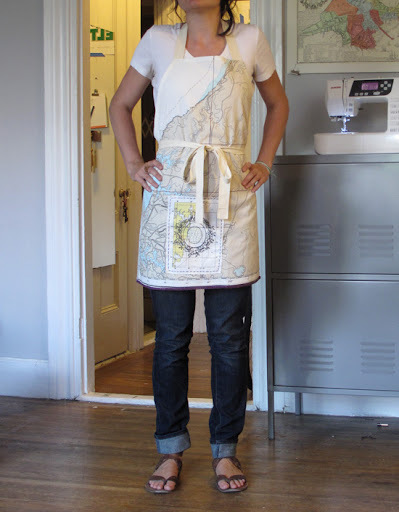 I've tagged this under gifts as well because I think a unique print apron is a lovely gift and even more lovely is how inexpensive, quick and easy they are to make. Great tutorial! Hopefully I'll make one this week. On a side note, I love your sandals. On another side note . . . what is it with you girls and maps? I think you're onto something, Tim. Is that a battery and a twist tie under your cabinet? I love your shoes! :) Where did you get them?! Thanks for all the detailed instructions and pictures! That is so helpful!